There is more information about this on the Government’s Planning Portal Website. Or you can download this pdf document – Planning Information. If you do not meet these criteria you will need to speak to your local planning authority. The rules will be different if you live in a listed building or in a National Park, AONB etc. so you will also need to speak to your local authority. Your local authority may give you free advice or you may have to complete a Pre-Application Advice Form which costs around £100.00. There have only been a few cases where our customers have had to make a full planning application and none, to our knowledge, that have been refused. If the floor area is 16m2 – 30m2, there is no sleeping accomodation and it is 1m from the boundary or made from substantially non-combustible materials. 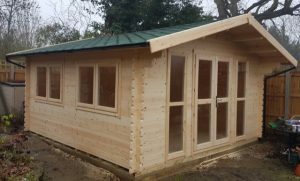 If you are unsure you should contact your local planning authority about log cabins. It is your responsibilty to make sure you have the necessary permissions and meet the necessary regulations.